With the weight below 4 lb, the Winnerwell Fastfold Titanium Tent Stove is backpack portable wood burning tent stove with all necessary elements for cooking and heating. Winnerwell Fastfold Titanium Tent Stove. Check on Amazon. They usually have the best shipping conditions with their stores on several continents. As you realize from the name, this is an ultralight titanium material that can withstand much higher temperatures than steel. You might want to know that its melting temperature is above 1650 °C (3000 °F) degrees, and steel melts at lower temperatures, dependent on the added materials. This is also a very tough metal and such a feature allows for using a very thin material, resulting in this stove that is below 4 lb of weight. Titanium also has a high heat transfer efficiency so the stove can heat a larger area than what you might expect from its size. This is also a very clever and easy to use fast fold design, hence the word Fastfold in the name. The stove collapses and packs to a very small size. All is based on the integrated clasps and you need no extra tools to make it ready. The legs fold for an easy transportation. The pipe is one single sheet of titanium. For transportation, it rolls width-wise, but for a pipe structure you roll it length-wise. Note that after the first burn it becomes much easier to roll it up into the pipe, there is a memory-effect in the material after the heating. It can be tricky to roll it for the first time, so it is best to do this together with somebody. There are several rings which you slide along the pipe to keep the structure. It is important to avoid wrinkles in this first rolling as they will then remain permanent due to the heating. The same applies to the stove’s body, so assemble it carefully with straight walls. They have built this piece really nicely, just see the picture below. It prevents sparks from flying out, but it is also with the closed top so the rainwater will not get in. It also has three attachment elements to secure it with guylines in strong winds. 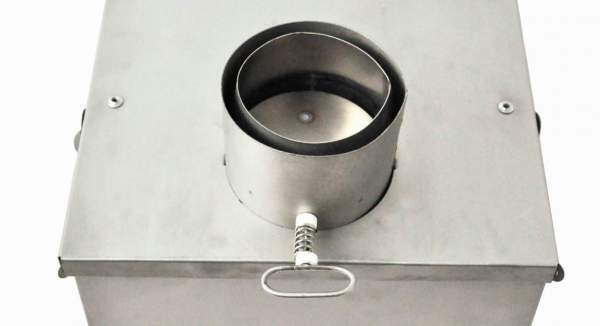 The pipe damper is integrated in the pipe section which is a part of the stovetop, see the picture below. Here too you have a nice example of their attention to details, you see the dual structure introduced to fix the thin and fragile pipe inside of it. The pipe damper is pre-installed. Capacity: This stove looks so tiny, but its firebox volume of 900 cubic inches is bigger than the Nomad Medium and the Woodlander Medium stoves from the same brand. They claim it is suitable for 2 – 4 persons but this will depend on the tent’s volume and design, so I cannot understand such a statement. It would be better if they give its BTU value. Weight: You will not find anything on the market that would be even remotely comparable to this stove. It weighs only 3.97 lb (1.8 kg). Now when you consider also its packed size which is 15 x 9 x 2 in (38 x 23 x 5 cm), you realize that this is indeed a backpack-portable stove. This all determines the users, so this is an incredibly versatile item. 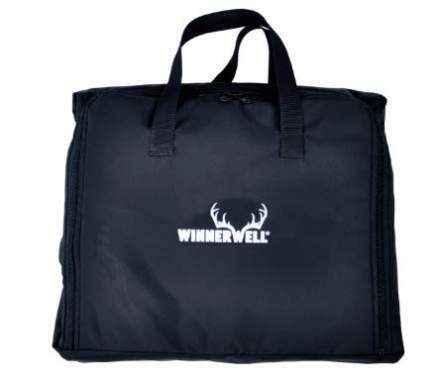 It can be used by hikers, hunters, fishermen, and you name it. Note that the pipe is straight and this is one single piece, and it is not really possible to add a 45 or 90 degrees elbow section. So this is a stove for tents with a pipe jack on the roof. There are several of them here in the site, see for example this White Duck Outdoors Alpha Wall Tent or the Danchel Bell Tent. Weight (stove + pipe): 3.97 lb (1.8 kg). Assembly dimensions stove body (L x W x H): 15.7 x 9.1 x 7 in (40 x 23 x 18 cm). Total height with the pipe: 122 in (310 cm). 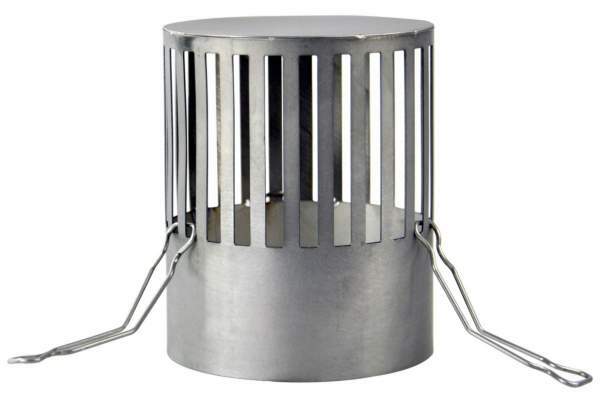 – Stove: 15 x 9 x 2 in (38 x 23 x 5 cm). – Pipe: 12 x 1 x 1 in (30 x 2.5 x 2.5 cm). Pipe length: 106.3 in (270 cm). Pipe diameter: 3 in (7.6 cm). Firebox: 900 in³ (14.7 liters). They suggest having at least 18 inches (46 cm) free space around the stove. Make sure that the burning stove is never unattended in the tent. The stove and the pipe are usually extremely hot so avoid contact and use gloves if possible. Supervise children and pets if you have them in the tent when the stove is in use. Be careful when you roll the pipe, its edge is extremely sharp. You might want to see some basic facts about the three stoves from this brand side by side. The other two are also described in detail here in the site so please follow the links for details and for the price updates. Observe the incredible weight of this Titanium piece. In the summary of this Winnerwell Fastfold Titanium Tent Stove review, I would stress again that there is nothing on the market even remotely similar to this stove. The material and the weight is unique, but this is a fully functional stove with all the elements you need for cooking in the camp. It lacks some functionality which you have in some other stoves from this brand, but those are definitely not backpack-portable as this Fastfold Titanium Stove. I have included this stove in my list of the best tent stoves for wood burning. If you need more options, please check this Uncompahgre Collapsible Pack Stove which also packs to a very small size. Please let us know if you have some experience with this stove, there is a comment box below. I wish you a nice day. Hi Robert, I shall leave your comment here so that people can contact you through the email. I normally do not provide such a service. That round titanium stove sounds interesting. How does it fold up? Hi Andrew, not sure what you are asking. The only round piece is the chimney which is a single piece which you roll along its length when you pack it, and you roll it transverse when you make a tube for the chimney. The main part of the stove is rectangular and it packs to the size of a laptop. Interested in your stove if available still? Hi Lorna, the stove is available on Amazon. Please follow the links in the text, you will find it.